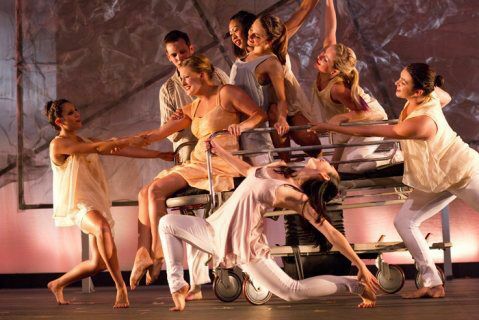 AMDA LA recently produced another successful production of Dance Workshop (our main stage Dance Theatre performance) on our outdoor stage in the middle of Hollywood, from August 23-26, 2012. 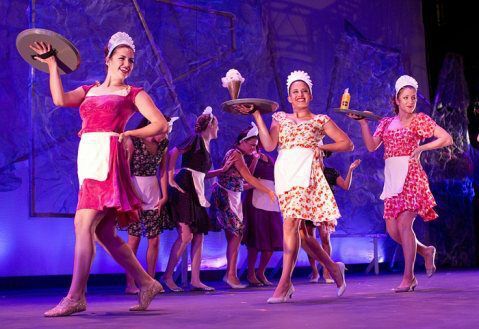 The cast included 40 dancers including understudies. We spoke with the director Marina Benedict, AMDA's Associate Chair of Dance, to find out all that goes into bringing this spectacular event to life. Marina Benedict describes: Here we are in the heart of Hollywood, outside on a warm summer evening, with DJ Good Cat spinning tracks. The stage lights aglow, 35 young dancers in full costume and make-up take the stage for the summer 2012 Dance Workshop. What a night! From hip-hop to jazz, ballet to contemporary, and everything in between, this evening of dance showcases the young dancers that will go on to work within the thriving LA dance scene and with some of the most sought after choreographers currently working within the industry today. We have created something here that is truly unique and LA is taking notice. We have a full house, the moon is out and framed by the famous Capitol Records building, you can hear the clicking of heals walking along the stars on the walk of fame, and the buzz of a weekend night in Hollywood is palpable. It’s Showtime. This summer the theme of the Dance Workshop, Such Stuff As Dream Are Made Of, has inspired a 50-minute, non-stop journey to the places we travel in the world of our dreams while the subconscious flirts with our imagination. How did we get here? Everything begins with the music. DJ Good Cat and I got together in early July and worked together to filter through 180 music tracks submitted by friends, students, faculty, and choreographers for consideration. Every song in some way related directly to the theme. DJ Good Cat worked tirelessly to create the mix. We kept at it and slowly the music revealed itself - a non-stop mix of 19 tracks ranging from The Roots to Roy Orbison to DeVotchKa. Once the mix was set, it was time to select the perfect line-up of choreographers that were right to take on the variety of styles represented. Joining us for the Summer 2012 Dance Workshop were choreographers Chryssie Whitehead (“A Chorus Line” on Broadway), Rob Rich ("So You Think You Can Dance", "Dancing With The Stars"), Donyelle Jones (“So You Think You Can Dance”), Aaron Porter (Film & TV Choreographer), Tracy Silver (West Side Story 30th Anniversary Intl. Tour, Fried Chicken and Latkas starring Rain Pryor ) and Jane Lanier (Guys and Dolls on Broadway, Jerome Robbin’s Broadway-Jane received a Tony nomination). After the choreographers were set, there were 7 tracks that were set aside for our student choreographers: Kayla Robert, Sheldon Springs, Jessica Ernvik, Alex Dratell, Jeni Baker, Natalli Dorn and Tasheena Medina. The buzz for the show begins building prior to auditions. Dance Workshop is one of the most highly attended performances opportunities on campus. After a grueling 3-day audition process and close to 100 dancers auditioning for the workshop, we had our cast and the workshop was under way. With only three rehearsals to create each piece (a total of 6 hours), these dancers have to be fierce and focused. This is a fast process and we need smart, versatile dancers. Choreographers are working quickly and their dancers are soaking up every bit of it. After three weeks of rehearsal we gather as a team to hold a closed internal screening of the work as is. We gather together and look at the work as a whole what works, what doesn’t work, what needs to be cut or adjusted. What is so wonderful about this process is that we are here to create the most effective performance we can and to learn as much as possible while doing it. There is exhaustion, but there is also a sense of accomplishment and a level of growth that is unparalleled. We become a company and we rise together as creative artists, students, designers and teachers. I have directed over 18 Dance Workshop performances and the growth I see in the students every semester is abundant. So we press ahead. Back into the studio to implement the notes from the screening and before you know it we arrive to the stage. It is time to implement all of the technical elements. We bring in our professional team of designers that includes costumes, set, lighting, and sound. Everyone is here to help realize the vision that has developed throughout the process. We have a show and now its time to share it with an audience. At the end of our run, we have danced through five successful performances and one extensive professional filming experience and it's time for the last finale. As the lights go down after the final bow and the stage begins transforming for the next BFA Musical production, I am already leaping ahead to think of what we might do for our next Dance Workshop. What will be the theme? Flight perhaps? See photos from "Such Stuff Dreams Are Made Of" below. Look for AMDA's next Dance Workshop to take place in Fall semester 2012!